A Unique, Whole-Body and Mind Experience. Fifty-five minutes is all it takes to transform the way you look and feel. Pilates will provide you with a unique, whole-body and mind experience. It will dramatically improve your strength, tone, flexibility, balance, and posture, creating a long, lean, strong body and a quiet, more focused mind. For the experienced, looking for the next challenge, the hurting, hoping to find a way to move that is safe and beneficial, and for the Pilates-curious, come in for a free session. 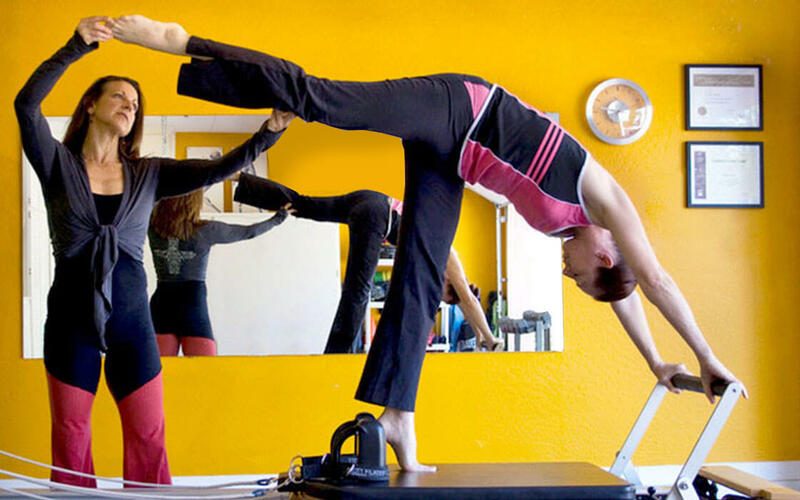 This session gives you an opportunity to experience a contemporary Pilates style, the studio, and the instructor. With a focus on learning about you, including a postural assessment, discussing your challenges, defining your goals, and a sample workout, you will come away knowing if indeed it is right for you. This session is available only to those who are new to Beyond Fit Pilates. Private sessions give students the one-on-one attention for a program perfectly built for personal fitness goals, sports performance, and special conditions, including post rehabilitation. For more advanced students, privates allow the instructor to assist in practicing higher level exercises safely. With the studio’s private environment, students can work confidently through their challenges with an honesty and a focus that cannot be achieved with anyone else in the room. for a package of 5-10 sessions. Semi-privates allow the instructor to give the constant, personal attention that a private session would receive, at half the cost. Semi-privates are especially fitting for those who would like scheduling flexibility, have special conditions/injuries where the exercises can easily be modified, and for practicing with a family member or a friend who would like to join them. Is there anything better than intentional movement to take a break during the workday? Ok, lunch is good for that, but maybe a couple of times a week, lunch can be eaten at your desk to make time for your body, your mind, and increased clarity and production on the job! “Sculpt-Stretch-Breathe” classes are held mid-day, within your place of work. Easy to get to and easy to get back to work. Pilates matwork exercises the core, while body weight, bands, and small balls, work the rest of you. Deep breathing, stretching, balance, and concentration punctuate throughout. No cardio, so only light sweat. Enjoy an hour of energizing music, movement, and co-workers, then enter the second half of your day refreshed; ready for more! Some special conditions can be given safe modifications, but a consult with the instructor should precede the first workout. Schedule Now or Contact for more inquiries.